IMHO, EvE Online is one of the best MMORPG's out there. One single international server populated by about 250000 people and counting, in a rich, diverse, spacefaring game. Massive, epic fleet battles occur in lawless space of over 1000 participants happen on occasion, and even populate the server so much that nodes have been known to crash due to the masses. A complex, diverse universe with economics, history, politics, trade, and perpetual war, this game has been going strong since 2003 and has gained numerous awards. Communities of role players band together to create a wonderful multiplayer experience. Huge alliances, corporations of pirates, traders, and navies roam EvE, its hard to get bored. Keep in mind that yes, the majority of the graphics are just as they are in the trailers, some actions however, have been dramatized (there is no crashing in EvE). And a nice holiday season contest open to everyone in EvE. If interested please reply to this post. The trial is free, and has now been extended from 14 days to 21. Try it out, and see if its the MMORPG you're looking for. If it is, please refer me as your buddy in the buddy program. thanks for the link new to all this so we will see how it goes! Did you do the tutorial? If you didn't, or even if you did, try it again, afaik they improved it in the last expansion. And regardless, this is the game where you HAVE to do the tutorial. Note the eiffel tower in the lower left corner for scale. I have to second that comment about the tutorial. This is NOT one of those where you wanna just jump in and start playing. It is imperative you play fully through the tutorial! But there is indeed a rich and deep elegance here that no other MMORPG on the market today can match. I do have a copy of Eve, However I brought it before I realised you have to subscribe. At which point I lost all interest. I thought that all MMORPG's carried a mandatory monthly subscription fee. Either way, that review is pretty funny. As true as it is, I thought the majority of MMORPG's had the same problems. EvE on the other hand, almost requires a community to make it interesting. And yes, the complexity is astounding, but rewarding. I don't know any other MMORPG in which you can forge an empire, hold territory, and ruthlessly invade other actual people's territory. The persistence of the server is also unique, whatever structure you build will stay until it is destroyed or taken down, I don't think anyother MMORPG can boast that. Last edited by BKnight3; 16 Dec 08, 14:58. Here are some youtube videos of some EvE wars, showcasing the everlasting chaos and political mayhem in the lawless areas of EvE. No NPC's were involved in these wars, with about a thousand particpants or more mobilized from around the world in each conflict. I thought that all MMORPG's carried a mandatory monthly subscription fee. However it's out of production now, isn't it? 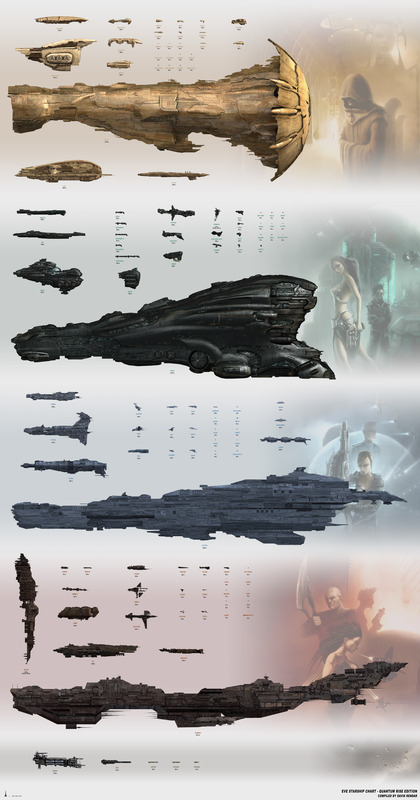 Anyway, the ship sizes chart was updated today with measurements, have fun. edit: btw, if it's the original retail version with the original box and manual still intact you might be able to sell it for novelty value. secondedit: You really need to view those movies in high-res to do them justice, they have the links to download in their description. The second video is especially nice and has a bit of a backstory. The basics are that BoB (Band of Brothers) alliance, one of the greatest and most powerful in game, had been beaten back into its home region after a year of war by a massive coalition. MC (mercenary coalition), the author of this movie and one of the most elite fighting forces in the galaxy, was a long time loyal friend and contractor of BoB, and as many others, was viewing BoB as a sinking ship at that point and decided to split and take some of BoB's old space for its own with an assortment of other mercenary alliances and name it Tortuga. Big mistake. Their split (or betrayal if you prefer it) gave a renewed sense of purpose for BoB and was spinned endlessly for their members as propaganda. The end result, BoB survived, the coalition crumbled and MC lost Tortuga and disbanded. Last edited by String; 17 Dec 08, 02:33. I don't have actual numbers on hand for confirmation, but I do believe there are just as many if not more free ones as pay-to-play ones. Many have a combination of both. Anarchy Online does this, offering it's base game and a couple of expansions for free, but if you want the latest and most up-to-date content expansions, you'll have to subscribe and pay. I've been playing AO for about three years now, for free, and probably have just as much fun with it as those who are paying. This is why I started posting about EvE in this forum, we have so much command talent around here. EvE is a wonderful training medium in some ways. All times are GMT-5. This page was generated at 01:34.